Bunk beds used by the Contreras family, Mexican-American migrant workers, in Wautoma, Wisconsin, 1970s-1980s. If home is where you rest your head, this bunk bed documents the process of Chicano migrant workers learning to call Wisconsin home. 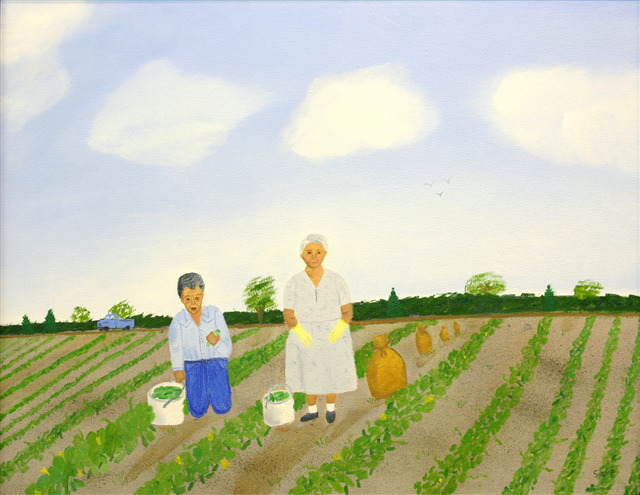 It was used by the Contreras family, migrant agricultural workers from Mercedes, Texas, who worked on Waushara County cucumber farms from the 1940s through the 1980s. 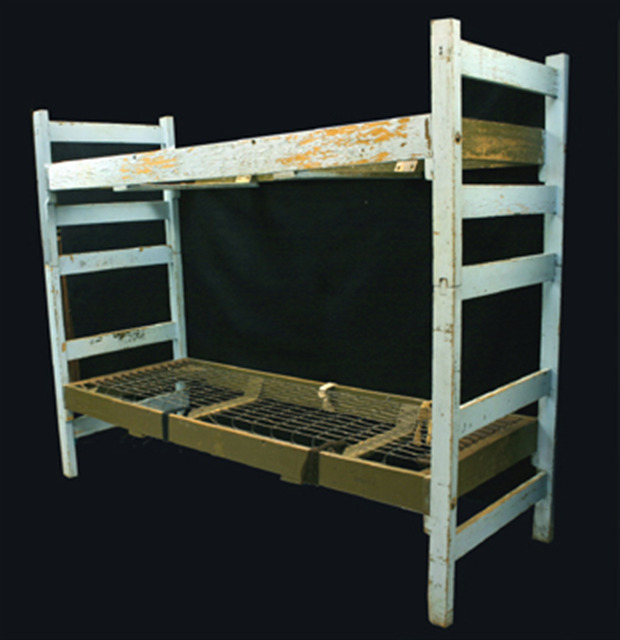 This bunk bed was originally made by an unidentified manufacturer for the U.S. Army between 1940 and 1960. 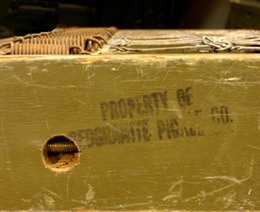 It is marked "Property of the Redgranite Pickle Co.," which probably bought the bed at surplus to furnish the housing it provided for its seasonal workers. Gerarda T. Contreras decided to settle her family permanently in Wisconsin in 1967 and purchased this bed from the Redgranite Pickle Co. in the early 1970s. Seven of Gerarda's nine children - Eliza, Ramiro, Consuelo, Lorenzo, José, Estella, and Seferina - slept in it in their house in Wautoma during the 1970s and 1980s. Seasonal workers have long supplied essential labor for Wisconsin agriculture, but the number of workers, their nationalities and ethnicities, their family structures, and the conditions of their work have varied considerably over time. The Contreras family's experience reflects the major changes in the Wisconsin migrant labor economy since World War II. Although Spanish-speaking workers arrived in Wisconsin in the late 1920s, and about 3,000 worked here annually during the 1930s, Chicanos did not constitute a majority of Wisconsin migrants until about 1950. Like almost all Chicano agricultural workers in Wisconsin since the end of the federal "Bracero Program" (1951-1964), the Contreras family lived in Texas, rather than Mexico. Like many migrants, the Contreras family traveled and worked as a multi-generational extended family. Led by Antonio Contreras (1893-1955), his wife Aurelia (1898-1994), three generations of family members have worked in Wisconsin. The shift from primarily unmarried, male laborers during World War II to family units afterward posed challenges to growers – to provide family style rather than dormitory housing – and to Wisconsin lawmakers – to pass and enforce child labor and school attendance laws. Contreras family members picked cucumbers for the Marks Brothers Pickle Co. outside of Wautoma, Wisconsin every year for several decades. It is not surprising that the family worked in the cucumber fields: since the 1970s, cucumber harvesting has required more migrant workers than any other Wisconsin crop. 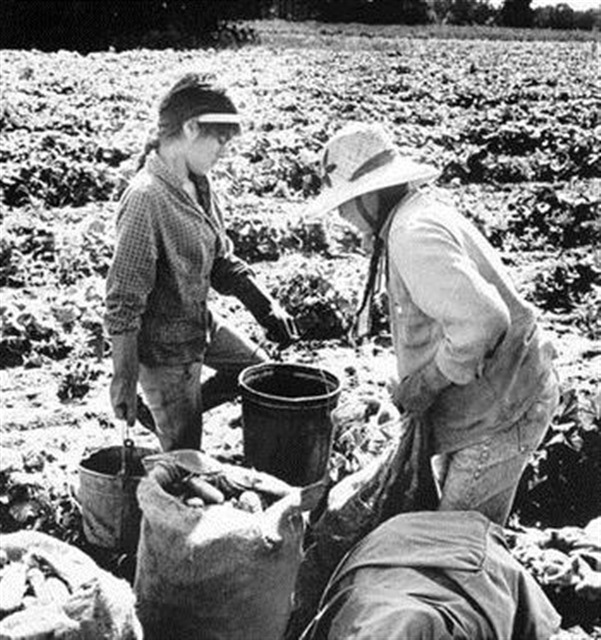 In 1978, cucumber growers employed 27% of migrant workers; the next largest percentage by crop was potatoes, which employed 6%. While the harvest of many Wisconsin crops, including sugar beet, potato, bean, corn, and cherry, has been systematically mechanized since the 1950s, cucumbers have resisted this trend and still largely require hand picking. Besides growing cucumbers in its fields, the Marks family operated a pickling plant on its farm, where various members of the Contreras family also worked. This, too, is reflective of Wisconsin's changing farm labor situation. As machinery and herbicides reduced demands for labor to harvest and cultivate crops, migrant workers have increasingly moved into food processing. 1968 was the first year more migrants worked in the canning industry than in the fields, and by 2003, about two-thirds of Wisconsin's more than 5000 migrants worked in food processing. The long relationship between the Marks family as growers and the Contreras family as pickers seems to have been the result of good working conditions on the Marks farm and mutual respect between the families. Other migrant families have experienced similar stability, encouraged partly by Wisconsin's 1977 Migrant Labor Law, which required a signed labor contract between employer and employee, which guaranteed specific start and end dates and an agreed-upon wage. The 1977 law was the culmination of a decade of organizing and protests by Wisconsin farm workers' organizations like Obreros Unidos. Since the 1970s Wisconsin observers have noted the phenomenon of Chicano workers "settling out" of agricultural work. Encouraged by educational opportunities and better employment prospects in Wisconsin, many Chicanos have opted to leave their south Texas homes and sink new roots in Wisconsin. Despite her own lack of educational opportunities, Gerarda firmly believed that her children would have better prospects if they stayed in Wisconsin. None of Cruz and Gerarda Contreras' children still works in agriculture, and all have earned college degrees. They are changing not only their own lives, but the face and culture of Wisconsin as well.